Another pattern unleashed on the world! It’s been a good year for my knitting and I’m happy to end it on a high note with this jumper. Fair isle as far as the eye can see! It’s an incredibly warm knit and it turned out even classier than I imagined when I started knitting it for the first time. Don’t you just love it when that happens? Always being on the look out for new construction techniques, I can highly recommend the ‘fake’ tubular ribbed bind-off for the collar on this jumper. It’s dead easy, looks neat and has none of the stretch that a ‘real’ tubular bind-off has. This makes it ideal for pockets, or in this case, square necklines that need to hold their shape. You can buy the pattern by clicking this handy button. 24 sts/ 28 rws per 4″ square on larger needles, in both Charts A and B. Exciting times! My first cardigan pattern is now up for sale on Ravelry! Just think, a year ago this was merely a doodle on paper and I was dithering about making it into a published pattern at all. There’s a lot to learn when first writing a pattern on this scale. The main lesson for newbies is this: Marnie Maclean is your new god! Her tutorials are fantastic shining diamonds on the knitting-net. Thanks to them I can now make the swishiest stitch charts without batting an eyelid. I’m so pleased to have this pattern out at last! Size: To fit 34(36, 38, 40, 42, 44)” bust with about 0.5” of positive ease. I’m between sizes and wearing the smaller one in these pics. 935(990, 1045, 1100, 1155, 1210) yds of smooth, elastic DK yarn in a solid or semi-solid colourway, preferably merino mix. 8 (8, 9, 9, 10, 10) balls of Sublime Extra Fine Merino DK (126yds/116m per 50g ball, 100% merino wool). Written instructions plus chart for Sashiko motif. Just in time for Christmas! You can’t go wrong with a beanie hat. I’m very pleased with how the plaid turned out. Not only do those black columns hide the unsightly colour jogs you can get when knitting in the round, it gives you lovely neat decreases too! I’ve already reviewed the yarn, Cornish Organic DK, but it can’t hurt to repeat my opinion of it being a delightfully sturdy wool yarn to work in. Any other decent wool should suffice though – I know I have fancy tastes. The pattern is now available to buy on Ravelry! It’s knitted in the round with fully charted decreases for your convenience – hope you enjoy it! Gauge: 22 sts/ 24 rnds per 4in(10cm) in plaid pattern. Also required: a tapestry needle for sewing in ends. Suggested Yarn: Cornish Organic Wool DK -100% wool. 251yds(230m)/100g. 1 skein in St Just (Charcoal), 1 skein in St Hilary (Amber). Additional notes: Taking these pictures was fun, but I would like to solemly remind you that swans are unreliable modelling props. I am very pleased with these latest gloves of mine. 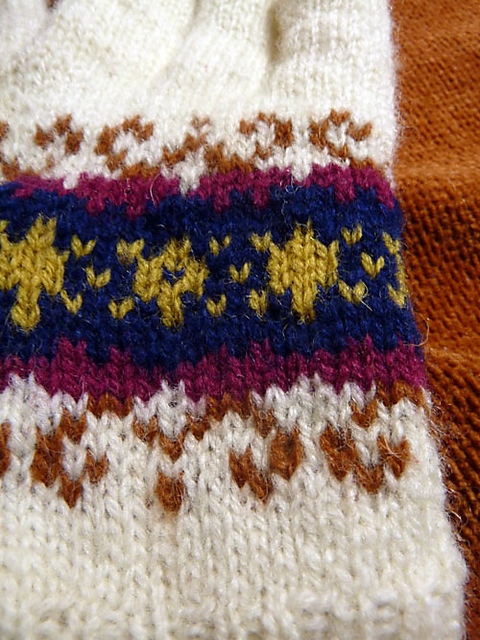 Looking at the pile of leftover yarn from my last fair isle project, I started thinking that the colours reminded me of a certain time of dusk, when the sky is both deep orange and blue. Hence: Blue Hour gloves. They are just the thing for using up scrap yarn! 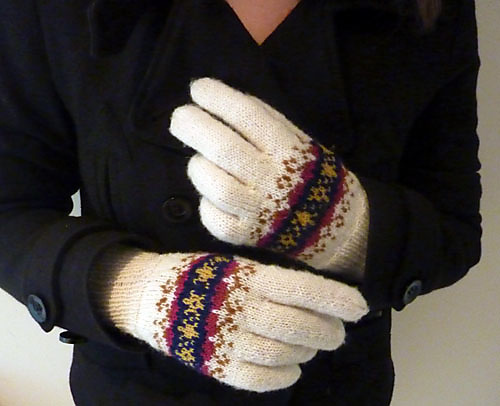 These thrifty little gloves have an original stranded pattern over the main body of the hand to pretty them up. There is also an afterthought thumb for simplicity. Mary Mucklestone’s excellent guide to afterthought thumbs. The ongoing “Vintage Knitting College” series at By Gum, By Golly – currently covering Colourwork 101! Size: To fit an average women’s size hand (7.5” around the knuckles). Jamieson and Smith 2-ply Jumper weight (equivalent to 4-ply) -100% Shetland wool. 125yds(114m)/25g. 2 balls of 01A for N, and 1 ball each of: 031 for O, 028 for Y, 043 for R and 021 for B. Gauge: 32 st / 36 rws to 4in (10cm) in stockinette stitch. Also required: Stitch holder, a small length of contrasting waste yarn, and a tapestry needle for sewing in ends. I have very poor impulse control when it comes to new yarn. Putting two balls of fat squishy merino yarn in front of me is just asking for it. Sure I could have continued with the projects already on needles but it’s just two balls of yarn how long will that take to knit up? And so! I have whipped my winnings into a cowl! Isn’t it awfully fashionable? It’s the ideal length for wrapping double around my neck and it’s as thick as I could want. No wind is getting through this cowl thank you very much. I wanted a sort of herringbone effect and after messing around for a bit it turns out that chunky yarn just needs the simplest of broken ribbing patterns to look good. This uses almost all of 2 balls of Sublime Chunky Merino Tweed and it’s such a nice quick knit I thought I would share it! I like my cowls on the loose side, so if you want something tighter, just cast on fewer stitches (in multiples of 4). Materials: 174 yds of Chunky(sometimes called Bulky) yarn. Suggested Yarn: Sublime Chunky Merino Tweed! 2 balls of! CO 112 sts , Place marker to indicate beginning of round and carefully join without twisting to start working in the round. Rounds 3 & 4: Repeat Rounds 1 & 2. Weave in all ends, block by gently washing in lukewarm water, squeezing out excess water and laying flat to dry. Update: The Ravelry pattern page is HERE!